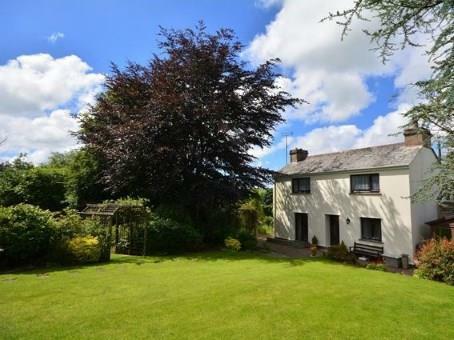 3 Bedroom Detached House For Sale in Camelford for Guide Price £400,000. This well proportioned family home offers an abundance of living space. A large lounge, separate dining room, fitted kitchen and WC. Upstairs there are 3 double bedrooms and a large family bathroom. The property is set in generous well stocked gardens where outline planning permission has been granted for a detached 3 bedroom home. Additionally there's a large workshop, detached tandem garage and parking for multiple vehicles. Hardwood front door opening onto the garden. Wooden flooring, radiator, access to first floor. Dual aspect uPVC double glazed windows overlook the gardens whilst the French doors provided access, Radiator and open fire. Double glazed uPVC bay window faces the front and overlooks the garden, feature fire place with open fire, radiator. Double aspect double glazed uPVC windows face the rear and overlook the garden. Fitted wall and base units, stainless steel sink, integrated oven, integrated hob, overhead extractor, space for washing machine and dishwasher. UPVC back double glazed door opens onto the garden. Built in wall and base cupboards, floor standing oil fired boiler. Double glazed uPVC window with obscure glass faces the rear, pedestal hand basin, WC. UPVC double glazed window faces the rear and overlooks the fields, laminate wood effect flooring. Dual aspect double glazed uPVC windows face the rear and overlook the fields, built in wardrobe. Double glazed uPVC bay window faces the front and overlooks the garden. Built in wardrobe, radiator. Double glazed uPVC window faces the front and overlooks the garden, radiator. Potential to develop the outbuilding, previously had permission for additional living space. This permission has now lapsed. The workshop has been divided and this area is now being used an additional utility room. Electric up & over door, uPVC side door, plumbing. Glazed window, power and light.